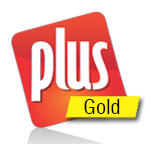 Plus Gold is accounting software suitable for Jewelers, Manufacturers & Wholesalers. It provides Metal Entry/ Metal Ledger, Touch / Waste calculation, Metal Outstanding / Metal Balance sheet etc. features.